Pesto is one of those universal sauces and spreads that can give healthy food a lot of flavor without the fat and extra calories. You have seen me use it in a variety of recipes, like my Caprese Turkey Burgers and my Grilled Flank Steak with Spinach Chimmichurri. I always make pesto myself instead of buying it in a jar because I make it with much less oil than usual. Mine tends to looks more like a paste than a sauce, and then I can use that base for a variety of things. For this summer pasta salad, I have made the pesto using a combination of fresh summer basil and organic kale. Kale is packed with nutrients like Vitamin K and C, it reduced cholesterol, and even is showing to be a cancer preventative. The more we can eat, the better! ¾ cup fresh basil, packed with stems removed. Bring a large pot of water to a boil. Cook the pasta according to package directions, about 7 minutes, or until the pasta is al dente. Before draining the pasta, reserve 1 cup of pasta water. Pour the pasta into a strainer and run with cold water to stop the cooking. While the pasta is cooking, make the pesto. Roughly chop the kale, basil, and garlic. Combine all of the pesto ingredients except for the oil in a food processor. Pulse well until broken down. Begin to blend and add the oil in a constant drizzle. As I mentioned, you want the consistency to be a paste, so you may use 1/3 or as much as the ½ cup depending on the size of the kale leaves. Set aside. 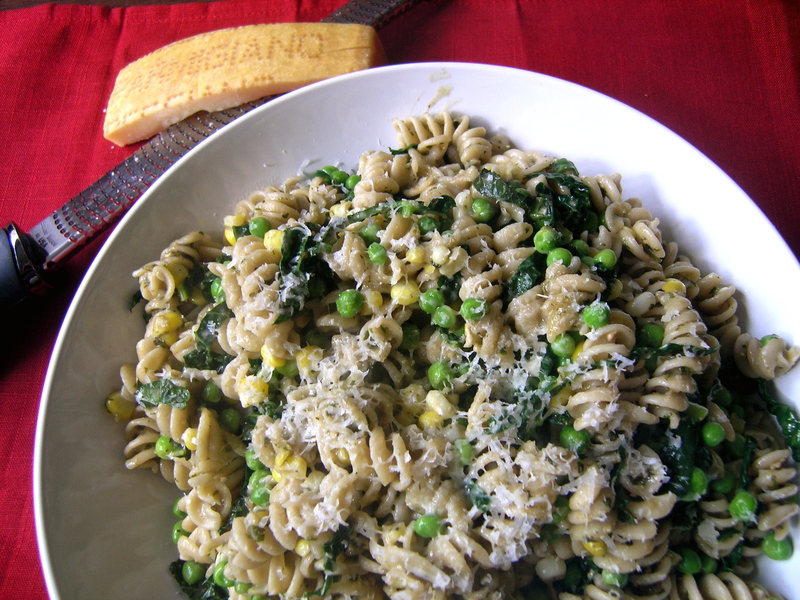 When the pasta is finished, use a knife to remove the corn kernels and chop the kale into confetti like pieces. Add the corn and kale back into the pasta pot and turn on to medium heat. Add about ¼ cup pasta water and cover for 2-3 minutes, or until the kale begins to soften. Add the pesto to the mix along with another 1/3 cup of the water. When it starts to make a sauce, add the pasta and remaining water if necessary. Stir well until everything is incorporated. Cover and cook another 2 minutes so the pasta can reheat. Season well with salt and pepper. Divide among four bowls and top with freshly shaved Parmesan to serve.